Santa Barbara, for many, is a destination which must be checked off anyone’s list. It has been the backdrop of many films on the silver screen. And why not? With its surrounding natural beauty of the Santa Ynez mountains with their lush green foothills and the iconic stucco homes and their terracotta rooftops, it is a welcoming sight. It is a home for those who could not decide upon living in the mountains or by the sea. Here they did not have to compromise and can have both. While there are many who come for adventure, surfing, sea kayaking, mountain biking and a day’s hiking trip, there are those who come to relax and get a taste of southern California about an hour and a half north of Los Angeles. And there is plenty to taste, from gourmet restaurants to those who want to showcase what they have from the farm to the table. Then there is the main event: wine. Lots of wine to be discovered and beautiful mountainside vineyards touched by the Pacific sea breeze that call out for a taste of the good life, some R&R and a picnic in the vineyard. Within mountain regions, you can find many variations of climate and weather patterns. 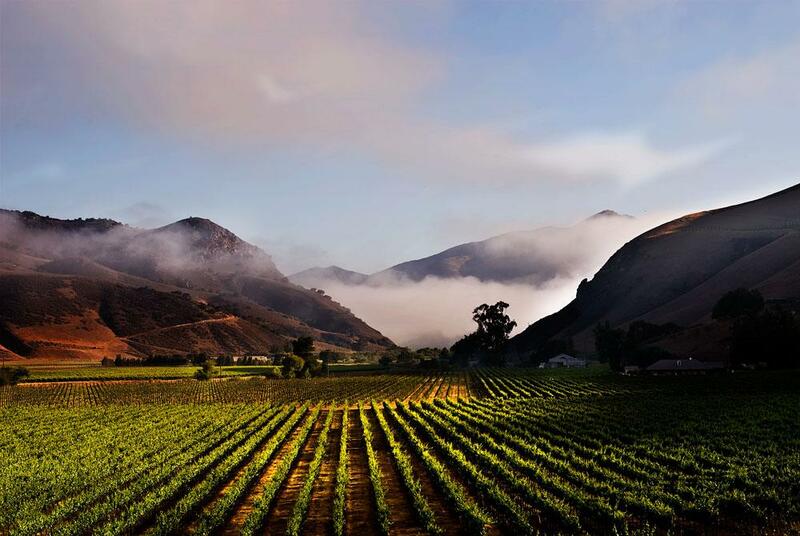 Santa Barbara is found nestled in the Santa Ynez mountains as are the vineyards. Here you can discover many different microclimates in some very special valleys and appellations. Each appellation has found its own varieties of grapes which thrive and can offer something different for the California wine drinker. There are officially five separate AVAs within Santa Barbara; Happy Canyon of Santa Barbara, Santa Maria Valley, Sta. Rita Hills, Ballard Canyon and Santa Ynez Valley. However, there are also some up-and-coming regions as grape growers and winemakers venture out into the region experimenting with different varieties and on the search for other unique climates. These include Los Olivos District, Santa Maria Bench and Los Alamos. They have not reached AVA status yet, but the future is promising. This region is found on the east edge of the Santa Ynez Valley AVA and digs in a little further into the San Rafael Mountains on the northwest part of Lake Cachuma. This means a warmer climate with a long growing season that is certain to aid in the maturation of varieties that need a little more time on the vine. The undulating terrain and mountainsides are perfect for hearty varieties of Cabernet Sauvignon, Petit Verdot, Cabernet Franc and even Cabernet Sauvignon. Rhone varieties are also popular in this region. 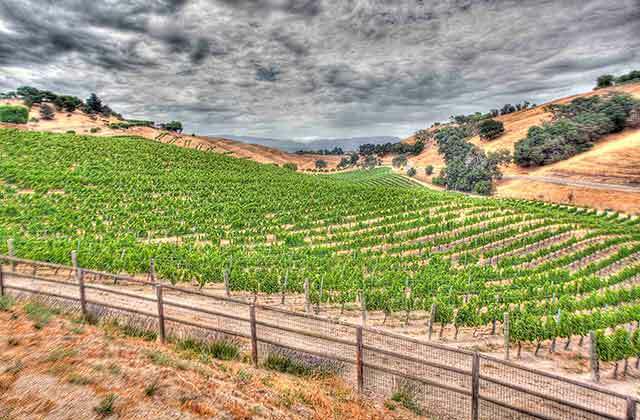 Located in the north part of Santa Barbara County is the Santa Maria Valley AVA. The soils here are known for their complexity and the region is known for its windswept landscape and variety of microclimates. It is here where the region feels its seabreeze come in from the Pacific, making it much cooler than other parts of the region. Morning to afternoon fog is common here as much as the ocean air, making it the ideal region for cultivating Pinot Noir and Chardonnay. The region has gotten so much attention for growing quality grapes that their fruit is purchased by other wineries and growers outside of the AVA to make wines. This AVA is located inside another AVA, the Santa Ynez appellation. While it is warmer in other parts of the region in the outskirts, this area is cooler due to clouds which come and rest here from the ocean with foggy mornings. Most of it will burn off later in the morning, but then the winds from the coast will vamp up, keeping things consistently cooler. The limestone soils and cool climate are also perfect for Pinot Noir and Chardonnay. With such a unique microclimate and soils much of the wines are very complex showing much from their terroir and a fresh notes in their fruit. The soils of Ballard Canyon along with being in the center of Santa Ynez Valley offer an ideal terroir for Rhone varieties of Grenache, Syrah and Viognier, while also being perfect for growing California king Cabernet, Cabernet Franc and Sauvignon Blanc. Located on the east to west region of the county, this AVA is known for the length it stretches out from the inland to the coast. With such a diverse region, there is a lot of influence from the sea, keeping some parts cool, while inland can heat up. Because of this, Santa Ynez Valley is known for its diversity in grape growing. Here you can find grapes of full-bodied whites with Viognier, Chardonnay, Tocai Friulano and lighter but medium-bodied wines of tropical Sauvignon Blanc and Semillon. The reds really take on a variety coming from all Old World cultures; Cabernet Sauvignon, Nebbiolo, Mourvedre, Malbec, Syrah, Pinot Noir and so much more. If you are looking for an outing along the wine trail in Santa Barbara, you can find many tours which can take you on a scenic drive from winery to winery past lush mountainside vineyards, or you can take a leisurely bike tour. It is up to you, it is your day, your moment in Santa Barbara; go as the wind and wine take you.